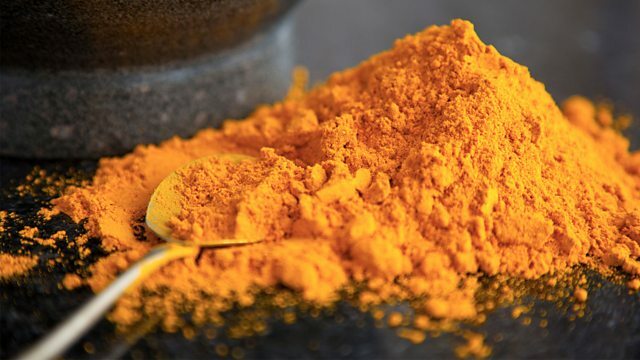 Sheila Dillon takes a golden-orange journey into the culinary use and the latest medical findings about turmeric. Turmeric is one of the healthiest spices used in Indian cooking. The active compound curcumin is considered anti-inflammatory and an anti-oxidant. The spice has been popular in Indian medicine such as Ayurveda for centuries. Wear gloves if you don’t want your hands stained! Mix the turmeric root, ginger and chilli together, then pour in the lemon​ or lime​ juice and season with salt. Transfer to a sterilised, airtight container, seal tightly and shake well to blend. The relish will keep well for up to 1 week in the fridge. Health drinks: Kombucha and turmeric—The Best Thing Since Sliced Bread?